We have had the A Level and Higher results. The newspapers have published their traditional photographs of young, attractive men and (mainly) women celebrating and the universities seem to be bending over backwards to offer places to all and sundry. More specifically, it’s not just the headline ‘male/female’ divide that matters. Yes, it’s important that we close it so that boys (especially white, working class ones) catch up with girls, but when it comes to the ‘difficult’ subjects – the ones that we need lots of kids passing and then proceeding to study at university level and beyond - the plain fact is that girls don’t do these in anything like the numbers required to fill the skills gap in the years ahead. The diagram above, taken from the Joint Council for Qualifications, shows starkly just how bad things are. 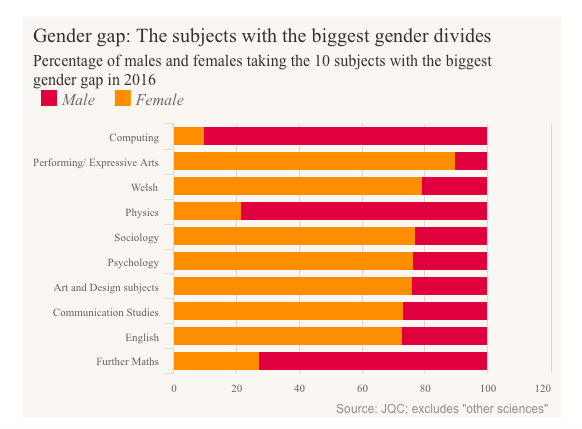 In the three key disciplines, Further Maths, Physics and Computing, the number of boys studying vastly outnumbers the number of girls. Clearly, as a firm that makes its living from placing computer scientists, engineers, developers and all manner of digital specialists with companies that are crying out for their skills, this is a concern. More importantly though, it’s not just serious for the recruitment industry, it’s extremely serious for the future of the country. When will we learn?